At first glance, Annemieke Alberts (1963) seems to have given her solo exhibition Framing the Landscape a name that aptly summarizes what it's all about. A frame around landscapes. But what kinds of landscapes are we talking about here? While drawing inspiration from the work of Jacob van Ruisdael, who usually also did not paint existing landscapes, Alberts bends the term landscape to her will. Framing the Landscape does not show inner-city environments, which regularly featured in Alberts earlier work, but landscapes on the fringes of the city. Moreover, these landscapes mainly represent a mental state. ﻿﻿Annemieke Alberts followed the teacher training in drawing in Amsterdam. 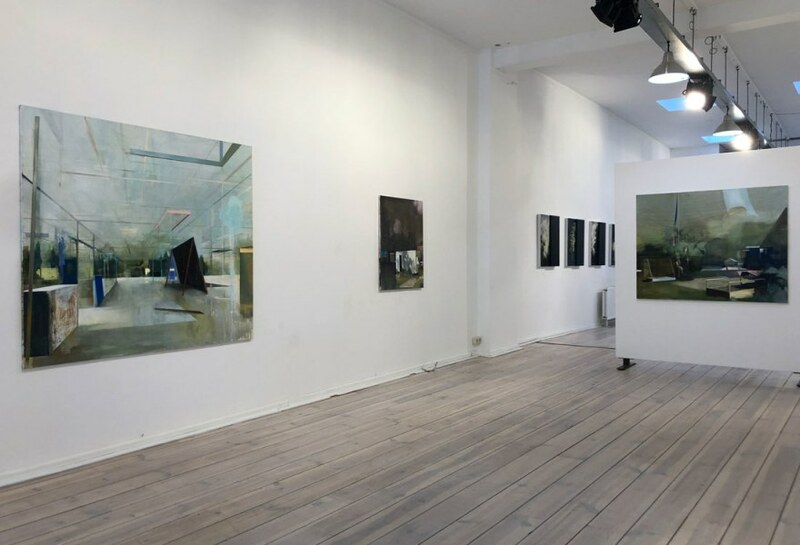 Her participation in the 2011 Summer Exhibition in the GEM The Hague, where she won the jury prize, marked her breakthrough with the general public. Framing the Landscape is her fourth solo exhibition at Galerie Roger Katwijk. Annemieke Alberts, The Announcement, acryl and oil on canvas, 160 x 160 cm, 2019. When you look at The Announcement, you might get the impression that you are standing in front of a work from the (Be)spiegelingen (series (2009-2014). The thinly applied paint and the sanded parts give the scene featuring a hazy meadow landscape an enormous velocity. As if you, as a viewer, are staring out the window of a passing train. That idea is further reinforced by the parallelogram on which the white paint is applied thickly; it seems to reflect light so that you can only see the reflection at that location. That appears not to be the case. The parallelogram from The Announcement is therefore not a literal reflection of light, which is something Alberts used to do. It is much more a compositional element that also represents a dreamlike state. Although Alberts is the first to acknowledge that her work is gradually developing - "I am not taking any major steps. At most I am moving up”-, a lot has changed since her last solo exhibition Nomos (2016). She exchanged the interiors that were central to Nomos for landscapes and opted for undefined, often fallow land instead of an inner-city environment with lots of concrete, steel and glass. Alberts works in series and knows only at a certain moment what the theme of the series is. That does not mean that once the theme is clear, all works are finished as if by magic. Alberts says he is a doubter who likes to share the creative process with the public. She brushes and sands the paint away if she thinks it doesn't work and continues to do so until you see the linen in some places. "If a work still wriggles, it doesn't communicate. Not with the public either. Sometimes the adjustments that I still have to make are minimal, but until then a work is not finished. " Alberts compares her method with good music. "When music is well composed and all elements are in a good place, the piece works regardless of genre." She cites the British band Radiohead as an example and inspiration. Around the turn of the century, the band exchanged their successful rock sound for a more electronic approach. An understandable approach if you consider the themes that the band deals with; introspective themes such as mental state, agoraphobia and anxiety dreams. But it was also a choice that many enthusiasts could not immediately appreciate. That also applied to Alberts. When she attended a concert by the band, however, everything fell into place and she understood that it did not matter which instrument the music was made with, as long as the composition was balanced. Annemieke Alberts, Into the wild, acryl and oil on canvas, 100 x 80 cm, 2019. The composition Into the Wild illustrates that Alberts devotes a great deal of attention to getting the composition right. The canvas already existed, only Alberts did not know how to complete it. In her studio, she looks out over a former caravan camp, which also houses the white building. That turned out to work well in the composition. The clutter in front of the house and the shadow that falls on the white facade give you the feeling that it is a place you would rather not go. On the left side of the canvas you see a diamond shape. That looks like a schematic representation of a gable roof, but the rest of the house is missing. Just like the parallelogram of The Announcement, Alberts has also added this element to make the composition function optimally. This also applies to the lines in the upper part of the canvas. What their function is, is unclear, but they certainly strengthen the composition. It is these unfinished elements, together with the sanded and painted parts, that give the works of Framing the Landscape their dreamy atmosphere and introspective quality. This stratification also ensures that you can see something new again and again, because "sometimes the reality alone is not interesting enough". Annemieke Alberts, Little paradise, acryl and oil on canvas, 120 x 150 cm, 2019. Another recurring theme in Alberts' work comes to the fore in Little Paradise, which depicts an allotment garden with a flag pole in the background. The cliché wants the Netherlands to be a raked garden in the eyes of many tourists. "You don't experience it that way until you notice it." Alberts was surprised by the raked-in city gardens in her neighborhood. "Even for such small gardens, a landscape architect is already involved." Such a perfectly designed garden gives the owners a sense of order, control and safety, Alberts thinks. Yet, in her it evokes a certain resistance against social standards or the system. Such an imposed standard quickly gives you the feeling that you do not fit into it. In her work you see this resistance reflected in brushing and sanding. "I like to use clear lines and surface distributions, but if it becomes too clear, I will intervene and scour."